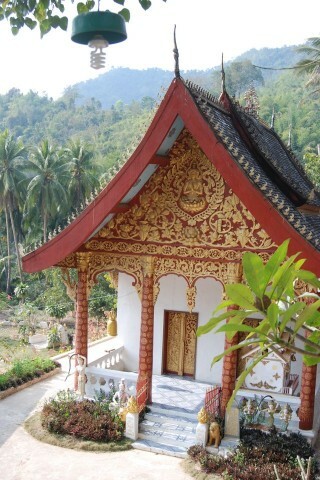 Of the two wats in Pakbeng, Wat Si Chome Chaeng is the more interesting to visit. Browse places to stay in Pakbeng on Agoda.com. Free cancellation. While neither of these wats are worth travelling across Laos to see, they’re a good excuse for a stroll to stretch your legs after a full day of sitting on a boat. The high vantage points at these two wats give you a view of sunset. Wat Kok Khor is about 500 metres up the hill and Wat Si Chome Chaeng is a kilometre away along the main road. Browse our independent reviews of places to stay in and around Pakbeng. Read up on where to eat on Pakbeng. Check out our listings of things to do in and around Pakbeng. Read up on how to get to Pakbeng. Planning on riding a scooter in Pakbeng? Please read this.